infographic. Be sure to check out the full thing. There is lots of agreement that sitting is bad. 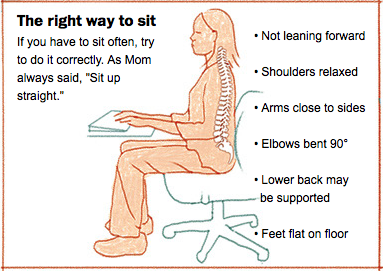 However, some of us are stuck sitting most of the work day, so maybe we should concentrate on improving our posture. I had sworn I wasn't buying any gadgets for a while, but I couldn't resist preordering the new Lumo Lift after reading that article in the Post. It's supposed to be released this summer and I'm psyched to try it. I learned about May being National Correct Posture Month from this campaign being conducted by BackJoy. If you're one of the first 500 people to take their pledge, they'll send you a Sit Smart thingy for free.